Around the country, graduation speakers are stepping up to podiums to deliver messages of inspiration and hope. But this is not your typical graduation season. This year, speakers honored at commencement ceremonies must calibrate their words of wisdom to cut through the chatter of a political season whose discourse has turned coarse, bitter, and disheartening. At Arizona State University’s commencement a few weeks ago, Teach for America Founder Wendy Kopp advised the newly-minted graduates to remember the importance of inclusion and diversity and the need to break down barriers that keep “millions of children from exercising their talents and achieving the quality of life they deserved.” (Zócalo is affiliated with ASU.) She called this generation “smart, savvy, discerning, amazingly connected” and capable of making a profound difference by seeing each other as members of the same team. Kopp’s vision of the world, and how young people should engage it, stands in stark contrast to the world described by many of the candidates out on the hustings this year. I don’t recognize that picture portrayed by politicians eager to divide us; Like Kopp, I have an abundance of confidence in the future, precisely because the young men and women in their caps and gowns are already fighting to build the kind of world we all want: Fair, just, and creative, with the capability to fix even the most complex problems. Politics and political rhetoric don’t define the entirety of our civic engagement, and so these graduates are right to believe in both the future and their power to shape it, without being deterred by dire partisan machinations. And these graduates’ sense of empowerment to contribute to society doesn’t stem from naiveté, but from the foundation for lifelong learning and adaptation they’ve acquired with their college education. I have an abundance of confidence in the future, precisely because the young men and women in their caps and gowns are already fighting to build the kind of world we all want. But what will it take for these graduates to pursue their goals and succeed in this deeply-polarized America? The answer is a simple and powerful technology: Teamwork. And the good news is that the same hyper-connectivity that at times poisons our political discourse with its unfiltered, raw immediacy can also be leveraged for collaboration and constructive teamwork. Indeed, Wendy Kopp’s concept for Teach for America is a model of how to leverage networks of well-intentioned and talented people wanting to make a positive difference in their communities. For more than 25 years, the organization has recruited recent graduates from top institutions to sign a two-year contract to teach in K-12 schools located in low-income areas throughout the country. Several studies have concluded that the program consistently provides effective, high-quality instruction to students who can benefit from it most. I am proud that 40 graduating Sun Devils have been selected to teach in TFA classrooms this coming fall. 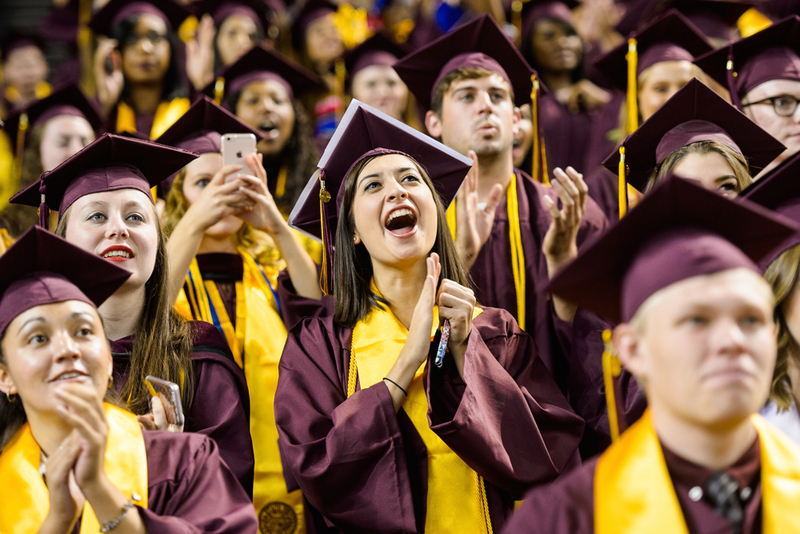 In a similar spirit, at ASU we are committed to expanding the benefits of a college diploma to a larger swath of people. And we seek creative forms of teamwork that can further this mission. One of our responses is an unlikely partnership with Starbucks to create a path to educate more of our nation’s population, encourage upward mobility, and respond to the challenges of social and economic inequality. Our resulting College Achievement Plan (CAP) provides a means for more people to complete their college education without being burdened by crushing student debt. A key aspect of this ongoing initiative is an evolving use of technology to enhance our digitally immersive course offerings. We are seeing the results with more than 5,200 Starbucks employees enrolled since 2014 and more than 100 graduates this spring. The fruits of this effort can be seen in the achievements of people like store manager Michelle Brown, a Sacramento, California, mother of two who had struggled both financially and with demands on her time before dropping out after two years of college. Through the CAP program, she just completed her bachelor’s degree in organizational leadership at ASU, and she will see her own daughter head to college this fall. Brown’s story is not unusual: There are thousands and thousands of smart, capable, and passionate people who for a variety of reasons had not completed their college degree on a traditional track. It is incumbent upon us as a society, and especially those of us privileged to work in higher education, to find innovative ways to connect with these people who have so much to contribute. The effort is not only about fulfilling their individual potential, but the nation’s as well. If we leave it up to our politicians to define the narrative around America’s prospects, we may be convinced that failure is at hand—and that teamwork is not a key to success. But that is neither a winning proposition nor true. Michelle Brown and her fellow graduates are wise to take their cues and inspiration from the Wendy Kopps among us, and to fight together for the future they want. That is the future we all need. Michael M. Crow is the president of Arizona State University. Zócalo Public Square is affiliated with ASU.